Vienna has many charming faces apart from the breathtaking opulence of it’s many sightseeing attractions. During your stay at our AllYouNeed Hotel Vienna4 you will find that nearly all of them are within easy walking distance, just as the famous Opera House on Ring Street, the Karls-Church, St. Stephen’s Cathedral or the Belvedere Palace with Gustav Klimt’s “Kiss” to name just very few. On top of this the AllYouNeed Hotel Vienna4 is located next to the Naschmarkt and it’s “Grätzel” (charming Viennese expression for a popular part of a district) of international fame, the Freihausviertel. Explore the trendy, the laid-back face of Vienna. Have a small talk with the friendly owners of little shops, discover modern art in the numerous galleries. So many restaurants, small pubs, bistros and wine-bars will not only make it easy to enjoy the culinary side of Vienna, but also will make it so easy for you to be enchanted by the charme of the city and it’s locals as well. The AllYouNeed Hotel Vienna4 offers its guests 104 non-smoking rooms with ensuite bathroom, hair dryer, flat screen TV with international channels, direct dial telephone as well as free Wi-Fi and LAN connection. Order your breakfast at our special online-price! 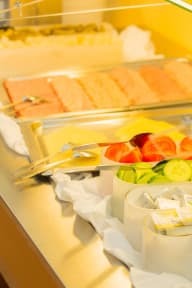 Warm breakfast buffet with a wide selection of goodies incl. drinks Euro 7,35 per person/day (instead of Euro 8.70 per person/night when ordering after arrival at the hotel). Also you can buy discounted parking tickets for a public garage which is located in the vicinity of hotel directly at reception. For those who need a short break after conquering the city centre, the hotel is the perfect place for a good rest. Thanks to its great location, the sights like St. Charles’s Church (Karlskirche), Vienna City Operahouse, Musikverein (where the world-famous “Neujahrskonzert” is broadcasted yearly on January 1st), Secession or the most famous St. Stephen’s Cathedral are just a short walk away. Underground stations U1 (station Taubstummengasse or Karlsplatz) and U4 (station Kettenbrückengasse or Karlsplatz) as well as tram lines 1 and 62 are located within walking distance.